← Getting Close to Eggplant! 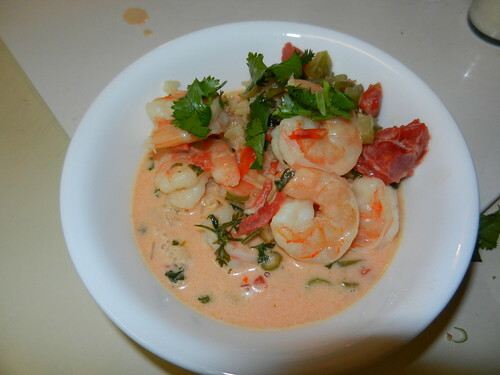 A couple weeks ago when I had some garlic and shallot scapes from the garden, I used them in a very simple and very tasty shrimp dish that my family likes, Coconut Shrimp Stew. 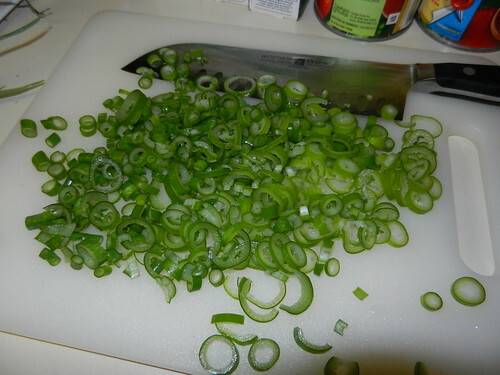 I chopped up 4 or 5 of the shallot scapes, just like I would have the green onions/scallions. Yum! The shallot and garlic went into the saute pan, and I chopped up some cilantro. 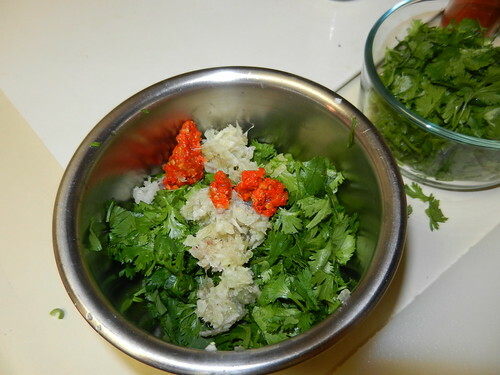 To that, I added about a tablespoonful of the minced lemongrass that I froze last fall and about 1/3 of a teaspoon of homemade Sambal Olek (a red chili pepper paste made with vinegar and salt) that I made two summers ago from bountiful red serrano peppers. 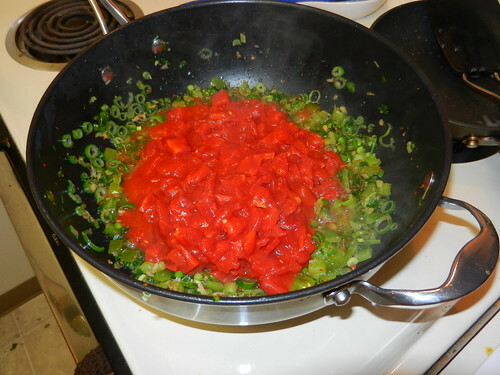 All of the flavoring ingredients also went into the pan for a quick stir. The recipes always say “saute one minute or until fragrant.” I think that’s an interesting way to gauge it. Then I put two cans of diced tomatoes in. I know. No fresh tomatoes yet, so we make do with canned. There is a time and place for good canned tomatoes. After letting the veggies cook for a few minutes, you add the coconut milk. I had some 1 cup boxes, so I think I ended up using 3 boxes. 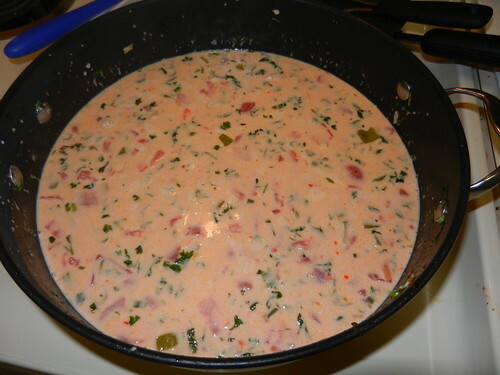 If you have cans, you want about 1 can of coconut milk per can of tomatoes. It makes lots of yummy sauce! You don’t want to cook this too long after you add the coconut milk or it might start to separate. As soon as you add the milk, you want to add in the peeled shrimp. The recipe calls for 3 pounds of shrimp, which makes 6-8 servings. We typically don’t need that much, so I make a full batch of the sauce and only add in the right number of servings of shrimp. Then we have extra sauce for something else. Anyway, add the shrimp and gently simmer until the shrimp is cooked through. Then you can eat it as a soup or serve it over rice. You can garnish the dish with some extra cilantro if you want to. This is a pretty quick, easy dish to make. It usually takes about 30 minutes, not counting the time to cook the rice. It’s a great, warm dish in the winter but also a quick, fresh dish in the spring or summer! Posted on June 20, 2013, in Harvesting & Eating and tagged cooking, garlic, peppers, shallots, Tomatoes. Bookmark the permalink. 1 Comment. 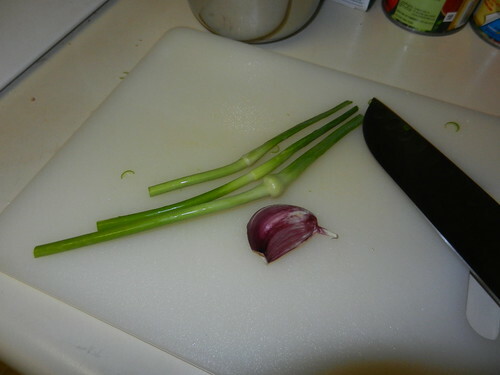 Have my own shallot scapes coming up and will definitely be trying out this recipe in the near future!